It’s hard to believe this group has been wowing fans for 88 years! Great show for all ages. 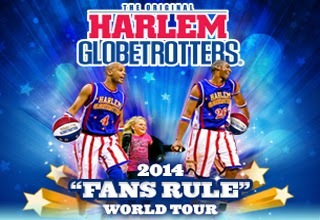 Last year the Globetrotters tried something different..the success was resounding..so they have decided to bring it back this year for their 2014 “Fans Rule” World Tour. Fans get to vote on and decide their funniest, craziest new rules! Go to the Globetrotters Web site to vote, then watch the show to see which new rules are put into action.